Meet: Q Energy, your new favourite 100% Natural Energy Drink! You may be hearing more about Quercetin lately. A natural anti-inflammatory, antihistamine and antioxidant, Quercetin (kwer-suh-tin) is a bioflavonoid (aka “super-antioxidant”) found in dark fruits and vegetables such as red onions, tomatoes, dark cherries and berries, spinach, and broccoli (and red wine!). Always on the lookout for healthy products, I came across Q Energy (“Q”), a 100% natural energy drink made with Quercetin. I use the word “energy drink” carefully … But it’s not just an energy drink. 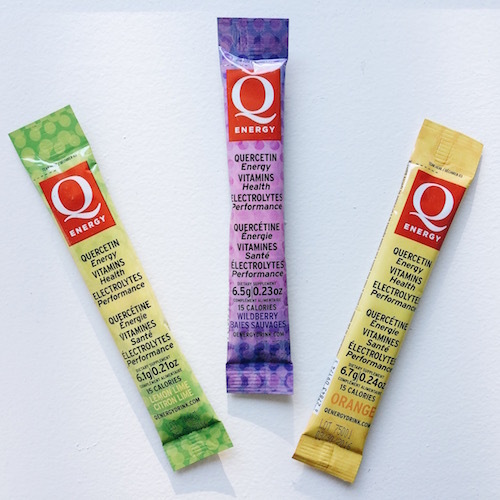 Enhanced with vitamins, electrolytes, and herbal extracts that help metabolize fats and sugars, increase stamina and fight fatigue, Q has been touted as a natural energy booster, a sport performance enhancer, an allergy fighter, and even a hangover helper (hangover = inflammation)! I started to drink Q during workouts because of its ability to rehydrate (the electrolytes help to replenish depleted salts) but quickly noticed (after about 7 days) that it also reduced any post workout soreness. Occasionally, I will use it if my muscles are sore from too much activity or dehydration, if I’m feeling any joint pain or inflammation, and I have also quite successfully used it to assist with “hangover management” (Ironically, Q also tastes great with vodka and is definitely a much healthier alternative to juices or soda pop!). Although the company doesn’t promote it’s product as a weight loss aid, it’s great for those who are watching their waistlines – it’s only 15 calories, is a solid alternative to a coffee or sugary treat in the afternoon, and because Quercetin helps our bodies use energy more efficiently, it is a great natural energy booster (without that crash you’d get from products that rely on refined sugar or caffeine). Besides all of these benefits, Q Energy was founded by an individual who is incredibly passionate about providing healthy energy to active people. He also generously donated product to the forest fires in Fort McMurray, Alberta so that the volunteers had a means of healthy hydration and energy. For more info, to buy online or to find a retailer, visit http://www.qdrinkhealthy.com.